Passengers are welcome to board the ship in Antwerp at 6:00 p.m. After comfortably settling into your cabins, we'll introduce our crew at a welcome cocktail. Dinner tonight will be followed by a tour of the old city in the company of our hostess. Day spent cruising. 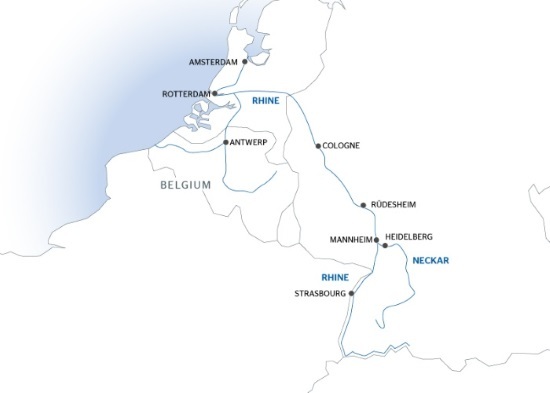 Our cruise will cross small inland seas and immense locks to reach Rotterdam in the evening. Tonight is our gala dinner and evening. Morning spent cruising to Utrecht. Join us on an excursion for both packages: The Keukenhof gardens(1). During this time, the boat will continue to Amsterdam. In the evening, join us on an excursion for both packages: Tour of Amsterdam by night on board a river boat. CLASSIC: Guided tour of Amsterdam and its diamond merchants. Enjoy time and lunch on your own today to discover Amsterdam at your own pace! Feel free to go shopping or visit some of the most famous museums such as the Rijksmuseum, Madame Tussauds or the Anne Frank House (entrance fees, guides, lunch and transfers not included). Enjoy free time in Amsterdam this morning. Join us for an optional excursion (not included in the packages): bike tour of Amsterdam or guided panoramic tour of Amsterdam and visit to a diamond merchant. In the afternoon, enjoy some more free time in Amsterdam. The evening is free to do as you please. We'll sail through the night to Nijmegen. CLASSIC: Visit to the Kröller Müller museum (3). DISCOVERY: Enjoy a great bike ride through the De Hoge Veluwe National Park (3). We'll spend this afternoon sailing towards Krefeld, reaching it in the evening. The morning will be spent cruising to Cologne. Enjoy free time this afternoon, or take a tour of the old sections of Cologne. We'll then sail on to Koenigswinter. The evening is free to do as you please. Our ship will cruise during the morning towards Rüdesheim, reaching it in the afternoon. Join us on an excursion for both packages: Depart by tourist train and stop at a wine tasting cellar*, followed by a visit to the Museum of Mechanical Musical Instruments. Tonight, enjoy free time to amble down the Drosselgasse, famous for its orchestras and cafes. We'll sail towards Mannheim this morning. In the afternoon, join us on an excursion for both packages: Visit of Heidelberg. Tonight is our gala dinner and evening. We'll cruise through the night to Strasbourg. (3) Except on Mondays: optional visit of the Dutch open-air museum in Arnhem.